The First Trailer for Hercules, Starring Dwayne Johnson! | Radical Studios, Inc.Radical Studios, Inc. The First Trailer for Hercules, Starring Dwayne Johnson! Less then a day after its global premiere during their CinemaCon presentation, Paramount Pictures has unveiled the first trailer for Hercules, a reimagining of the legendary mythological character starring Dwayne Johnson. 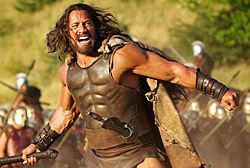 Based on the Radical Studios graphic novel “Hercules: The Thracian Wars” and directed by Brett Ratner (X-Men: The Last Stand), the action adventure also stars Ian McShane, Rufus Sewell, Joseph Fiennes, Peter Mullan, John Hurt, Rebecca Ferguson, Ingrid Bolsø Berdal, Aksel Hennie, Reece Ritchie and Tobias Santelmann. You can watch the trailer in the video player below, but earlier on Monday, ComingSoon.net had a chance to sit down with a small group of journalists to talk to Johnson about playing a character that’s been a passion project for him going back over ten years to when he made The Scorpion King. “When we meet this version of Hercules, he’s gone through a tremendous amount of trauma and anguish of the fact that (his family is dead),” Johnson said as he skirted the subject on how Hercules’ Godly lineage is handled in the movie. “When he’s introduced in this story, he doesn’t care about his faith and who everyone claims him to me. It doesn’t matter to him, because he doesn’t have his family anymore.” In fact, Johnson plays an older Hercules, later in his life, and the movie starts out after he’s already done his 12 labors, although we still will see quite a few of them enacted as flashbacks. Possibly one of the more interesting aspects of the movie, especially in this day and age when revealing the look of a character often plays a huge role in people’s perception, is that Johnson had been documenting the making of the movie over the six months in Budapest, Hungary without actually revealing his face. His pictures showed Hercules from the back or from odd angles but we never actually saw him with the long hair and beard as revealed in the poster. 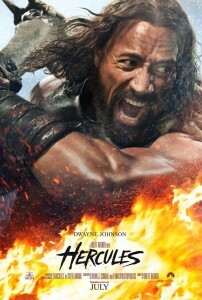 When asked about his process for coming into a character like Hercules compared to others, such as his character in Michael Bay’s Pain & Gain, Johnson responded, “It’s pretty much the same process, especially with those two characters, where they’re a bit heightened, and yet at the same time you still want to ground them in some reality and some humanity. There’s an empathy to them as well, because they’re both big characters with a lot of things going on, and a lot of violence happening with both of these men. I have a specific set of tools that I like to continue to add to as the years progress and the movies progress, and then bring that to these characters. While there are obvious comparisons to movies like 300 and Gladiator, Paramount will be releasing the movie with a PG-13 rating although Johnson said that they’re pushing the limit on that rating, and that it really comes down to how much blood you see on screen. 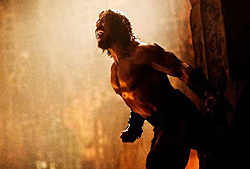 Of course, whether Johnson makes another Hercules movie will largely depend on how well this one does at the box office, but they do have a few ideas where a second movie might go, including a possible teaming with Jason and the Argonauts. Hercules opens nationwide in 2D and 3D theaters on July 25.